Hot tears threatened to overtake my usually controlled emotions as I sorted through the state of things. It is a dreadful thing to watch a loved one suffer or falter, and the harsh reality I had been forced to reckon with was eating at me. I was a mess, and there was no solution (humanly speaking) for the ache in my heart. You know what I’m talking about. We’ve all experienced heartache. 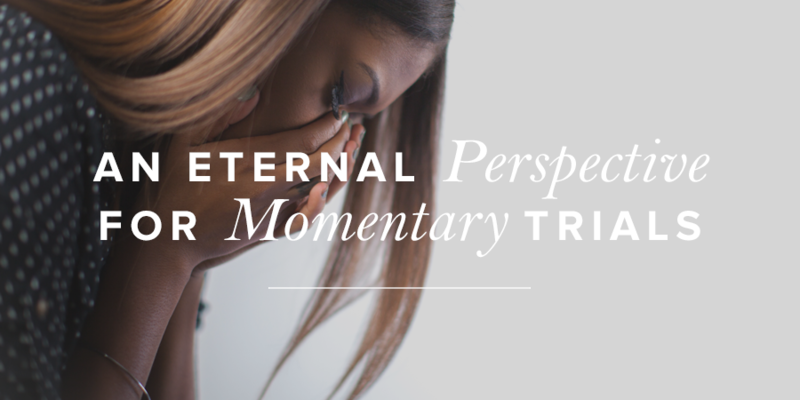 It doesn’t matter if you’re a bystander to the fiery trial or an unwilling participant, we’re all too familiar with the painful effects of living in a fallen world. Some days the burden weighs heavier than others, but each time it threatens to undo me, I’m faced with a choice: give in to despair or turn to Jesus. I wish I could say I turn to Jesus every time, but the truth is I don’t. I often prefer, for a time at least, to wallow in my grief, to lash out in bitterness at the one whose poor choices have caused this pain, or even to question the God who seems to have chosen to ignore my plight. It will come as no surprise to learn that I am not the first human being to fall prey to these thoughts of anger or bewilderment in the face of hardship. Since the beginning of time, mankind has searched for something or someone to blame for their discomforts, their disappointments, and their disobedience. Life is difficult and confusing, and we want answers for the unexplainable. An Old Testament contributor to the book of Psalms, Asaph was not afraid to pour out his frustrations before the Lord. I am so troubled that I cannot speak. . . .
Has he in anger shut up his compassion?” (Ps. 77:1–4, 6–9). This is a man in deep distress singing his sorrows to God. He longs for answers like a defendant who awaits his fate, hoping against hope that he will be acquitted. Does justice prevail? Will Asaph find his much sought-after relief? The answer is surprising, as there are neither signs of Asaph’s circumstances changing nor of his grief lessening. However, one thing did change—his perspective. Rather than nursing his wounds, Asaph begins to look back . . . and look up. The blinders come off. The smudged glasses are removed. Tunnel vision is replaced with a wide lens. Suddenly he sees the bigger picture and begins recalling the faithful acts of his God from his past. the children of Jacob and Joseph (vv. 11–15). I’m sure the hurt was still there. I’m sure Asaph still had unanswered questions. But in this moment of recollection, his focus shifted from his misfortunes to his Mighty God, and in so doing his complaints and self-pity were replaced by wonder and respect. the skies gave forth thunder; your arrows flashed on every side. You led your people like a flock by the hand of Moses and Aaron (vv. 16–20). Does this ease the ache in your soul? Is your heart beginning to rejoice? Are you standing in awe of your God—the God whose grace is more vast than the waters, whose love is deeper than the seas, whose strength is mightier than the thunder, whose goodness is brighter than the lightning, whose ways are inexplicable and beyond our understanding? Oh, how I hope your own heart is comforted as mine was as I read this Psalm this morning. In a desperate search for relief from my current woes, I found more than a reprieve . . . I found release. This wild roller coaster ride of Asaph’s that I was on, with all its twists and turns and sickening loops, came to a sudden, screeching halt. And I gratefully stepped off. How are you handling disappointments, heartache, and despair? Next Article Does God Care About My Prayers?